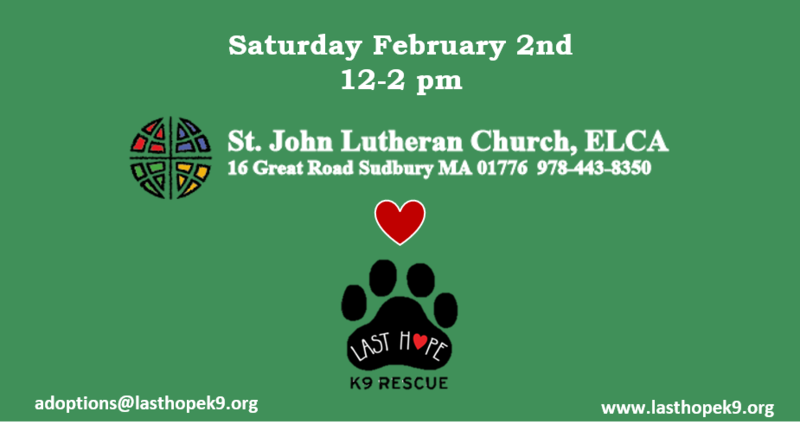 St. John Lutheran Church & LHK9 Adoption Event! « New Year , New Pup BIG Adoption Event at The Village Club! Please note applications need to be submitted on our website prior to the event if you wish to put a deposit on a dog. Deposits can only be done in person at events. * We are excited to be back at St. John Lutheran Church on Saturday February 2nd from 12-2! There is parking on site. Come on over to the Heritage Room and meet your new best friend! Note: Deposits hold the dog for you while an application is processed or until they can meet animals or other people in your home. Deposits can only be done in person at events. Dogs cannot go home from this event. The deposit is non-refundable, but does come off of the adoption fee if the dog is adopted. See the “DISCUSSION” tab on our Facebook event page to see the list of dogs attending. We post a list of the dogs by Thursday before the event and keep it up to date until the event!